It’s not often you can find pieces that straddle the line between work and weekend so effortlessly, but Banana Republic nails it every time. Need proof? Look no further than their summer collection. Celebrating casual as a state of mind, each style from the collection allows you to get as dressed up as you want (or not)! To share the versatility of the collection, I wanted to share a few of the pieces that caught my eye and how I would style them for work, weekends and even a wedding! The best part? All three dresses are currently on sale for only $60. Why not get all three?! I adore a good one-shoulder neckline, and this bow-adorned number is right on the money. Plus, who doesn’t love stripes? 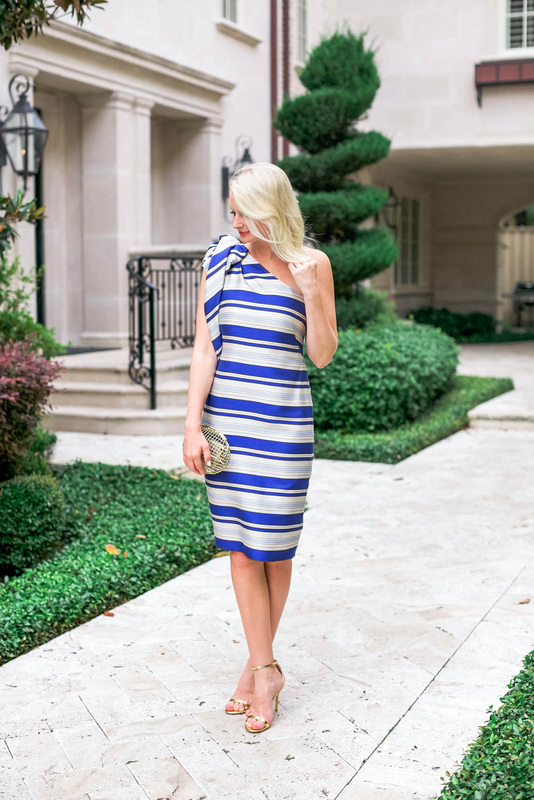 The length and silhouette are definitely sophisticated, but the stripes and bow detail add a playful touch to this cocktail dress. Perfect for a wedding this summer! What I love most about this piece is it’s neutral, wear-with-anything color. The shape + belted waist are incredibly flattering and slimming, while still being totally appropriate for any work function. The silhouette and lightweight fabric is ideal for summer, however it will make an excellent transitional dress from summer to fall. Throw on a leather jacket for an added layer, or change out the accessories for a darker color palette when the weather starts to change. PS: it also comes in red! Y’all know how much I love the color yellow this time of year, right? This juicy shade just screams summer (lemons! sunshine! ), and the shift silhouette on this dress can be worn for practically any occasion. Just switch up the shoes and accessories to take it from day to night with ease! This beauty also comes in white, for those of you who are color averse. Click here to discover more must-haves from Banana Republic’s summer collection, including this figure-flattering white dress, this pom pom shift, and this off-the-shoulder mini. These dresses are for sure sophisticated but still fashion-forward! I love it! Stunning! You always look so on point. What brands of clothing and shoes would you recommend for good value for money for those of us in a more limited budget but who still want to look put together? Zara is a firm favorite in this category for a lot of people. What are your best tips? Both of these dresses are beautiful on you! I am obsessed with your statement earrings. They look awesome with that yellow dress! Love all the dresses, especially the yellow! All of these are gorgeous but I’m really loving that yellow dress on you! So vibrant and such a great summer dress! Those dresses look so great on you!